To live or to die, that is the question. 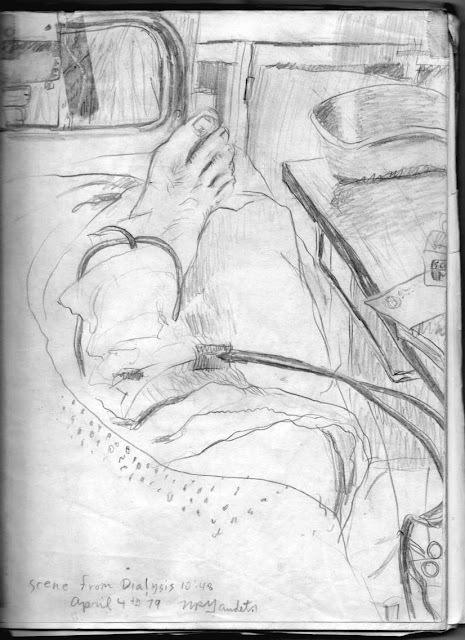 In 1979 at age 19, while living and working as a freelance artist in Toronto my health was dramatically imperiled by End-Stage Renal Failure. If the term 'End-Stage' sounds ominous, it's because it was! Without emergency medical intervention I would've been a dead man. The toxins had accumulated to such lethal levels that the team of ER doctors were shocked that I had even managed to make it into Sunnybrooke Hospital on my own two feet. 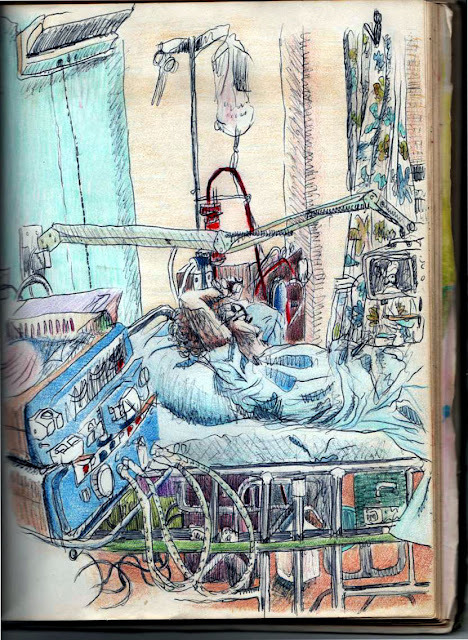 After my timely diagnosis I was outfitted with a 'Shribner Shunt' that allowed emergency dialysis therapy the very next morning. Once I had received the dialysis therapy for about five months I started to feel more human and less like a walking toxic waste dump. Kidney failure is an extremely precarious state of being! My neighbor on the dialysis ward with my machine in the foreground, April 1979. Making the best of a crappy situation. A wonderful resource person at the hospital arranged for me to take over an empty room in the hospital as a make-shift studio and even supplied me with a budget in order to outfit myself with paints and canvas to enable me to start painting again as a way of getting back on my feet to regain a sense of normalcy in my shattered life. I decided to create a mural that I called 'Recovery I' as a salutation to what I hoped would be an eventual return to health. You might say that this mural was an 'invocation' for my own recovery from what was a shockingly horrific disease. As a small token of appreciation for the excellent medical care and life-saving intervention I received at Sunnybrooke, I decided to donate this mural to the institution. It hangs in the main lobby there to this day. "Recovery I" was designed and painted as an invocation for my own eventual recovery from the ravages of End-Stage Renal Failure. Although the onslaught and aftermath of this disease was a huge setback that caused a lot of negative impacts in my life, I can now in retrospect say that the net benefits of the whole experience far outweigh the deleterious. Although I certainly would not recommend this trial by fire to anyone, for me the experience set me on a path to self-discovery though my path as a life-long artist that I would never regret. Sure, there have been times when I almost wished I had settled for a more financially secure career but all in all, it has been a great ride and just keeps getting better! Inspiration or Delusion? Let History Decide. Very soon after my eventual kidney transplant...which freed me from the exhausting routine of thrice-weekly dialysis treatments...I was a recipient of another kind: a powerful vision came to me in a vivid 'waking dream' of three triangles hovering in space. They contorted and rotated to join together to form a single design of three triangles 'within' a single triangle. Lest I sound like a total nut-job in describing this as a 'mystical experience' I will share with you the exciting development of the following days. With the confidence of one 'inspired', I took my crude pencil sketch of my three triangles to the Archbishop of Halifax at the time, professing to him that I believed it to be a 'mystical vision' that encapsulated the mystery of the 'Trinity', which in Roman Catholic terms is the 'Father, Son and Holy Spirit'. Much to my delight and amazement (but really, not a huge shock or surprise; I was THAT confident) the Archbishop made an executive decision on the spot and assigned the parish priest to oversee the execution of a mural in St. Mary's Basilica which I proceeded to work on with vigor! Applying the first few strokes on 'Trinity AD 1981' at St. Mary's Basilica in Halifax. 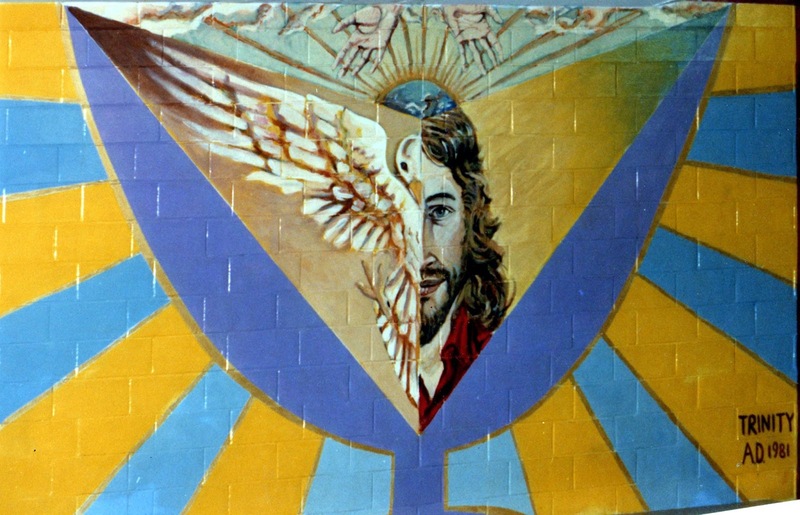 After about three months I had completed the mural which I called "Trinity AD 1981" in the modest setting of the Parish Hall of the Basilica. 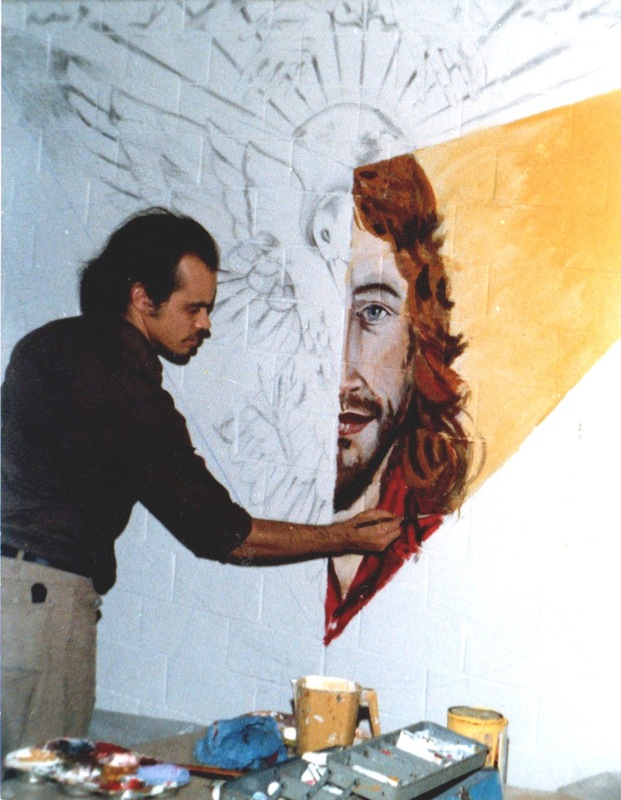 My dream at the time was to someday be commissioned to design and paint a much larger and grander mural in the Sanctuary of a sacred space. Alas, this was not to be...until exactly 30 years later! 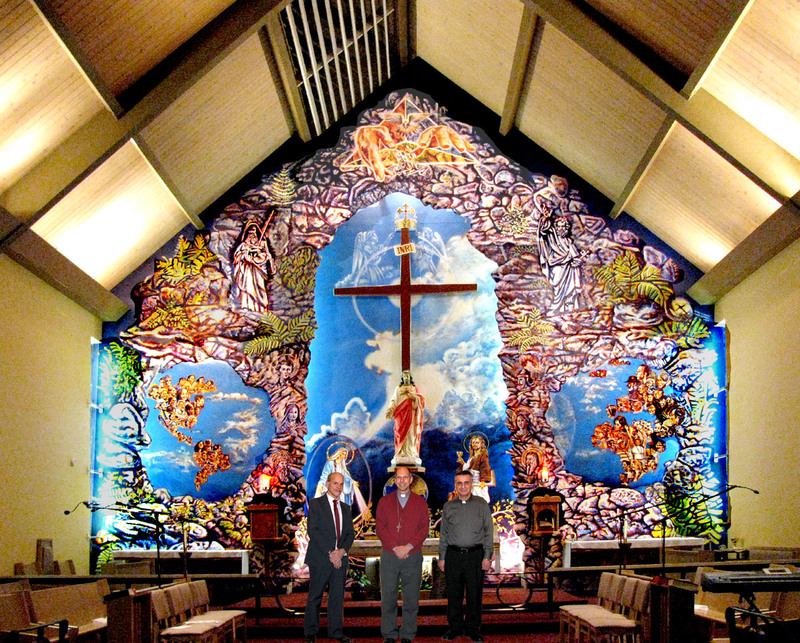 The finished mural 'Trinity AD 1981' in its humble setting at the parish hall of St. Mary's Basilica. 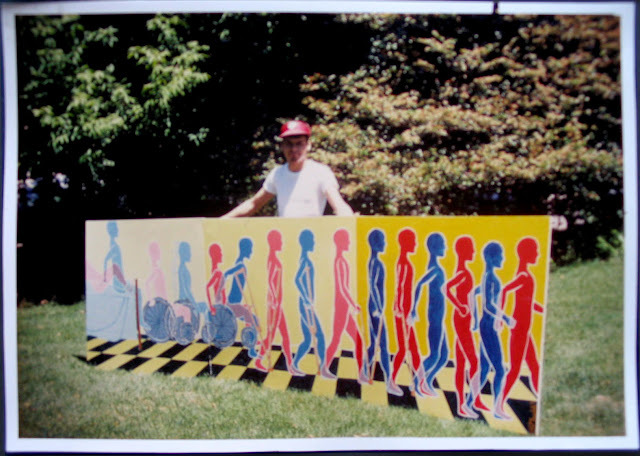 Although the mural was a fairly modest size and scope, it generated a lot of notoriety in the local media. I think the main reason for this was the audacity of an 'outsider' taking his unlovely pencil sketch into the hallowed offices of the Archbishop with the confidence that it would be honored by a designate wall on which to flesh it out to a full-blown mural. Take that! My mother Shirley Gaudet stands with the Archbishop James Hayes and myself on the occasion of the unveiling. Success ALWAYS leads to more success! In my experience, one success ALWAYS leads to more success and this was a good test for that theory. 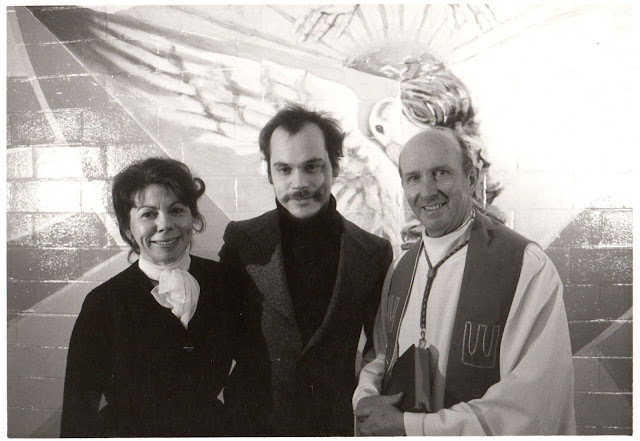 Soon after the completion and unveiling of this early mural, I was recruited as a 'liturgical design apprentice' to the eminent Interior Decorator and Architect the (late) Reverend Father Toby McIvern with the Montreal design firm Desmarais and Robitaille Inc. where I worked for two very formative years. Indeed, Fr. Toby's glowing letter of endorsement was key to my much later commission of 2011/12 to design and paint a huge, ambitious mural in the coveted 'sanctuary' of Sacred Heart Chaldean Catholic Church in Saskatoon. 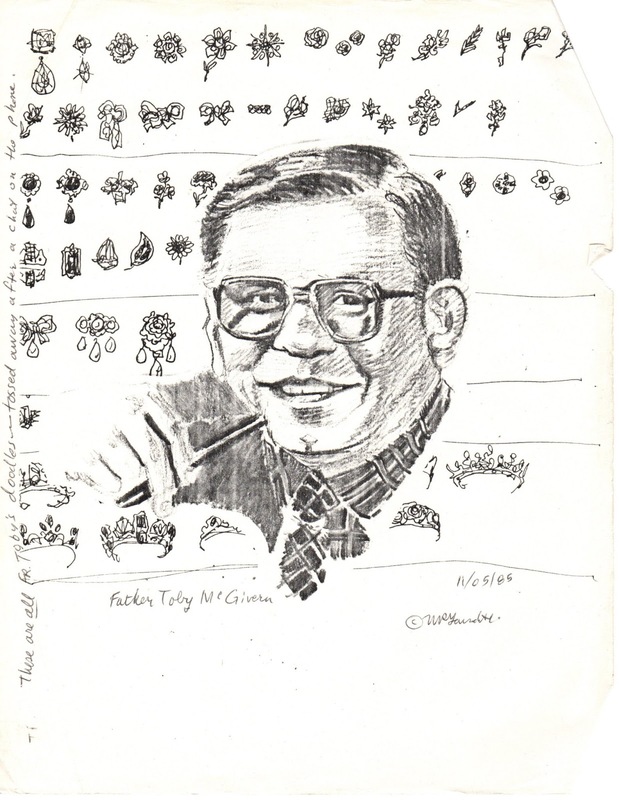 (The late) Reverend Father Toby McIvern posed for a quick pencil sketch on 11/05/85. The decorative 'doodles' in the background were rescued out of the wastepaper basket as Toby tossed them out after a chat on the phone. I have chosen these particular artworks to drive home the point that artistic vision and 'inspiration' remain potent and powerful forces even in today's world; they are not outmoded artifacts of a bye-gone era. Working high up on the scaffold on the upper right-hand side of 'March of Trinity' aka 'Trinity 2011'. Imagine my state of mind working on the ambitious mural that covered the entire sanctuary wall of Sacred Heart Chaldean Catholic Church fully 30 years after the humble 'Trinity AD 1981'. Words like 'ecstasy' and 'euphoria' come to mind...if only things were that simple. If you want to take a closer look at the work-in-progress of this 2011 mural, check this video which pans across the entire surface and proffers some intimate views obtainable only by high-definition zoom lens, as the artwork soars to a height of almost fifty feet at the apex. 30 years after the creation of 'Trinity AD 1981' in Halifax I was honored to stand with His Excellency Roman Catholic Bishop of Saskatoon Donald Bolan and Father Sabah, parish priest of Sacred Heart Chaldean Catholic Church in Saskatoon, SK. on 03/03/2012, the day of the official unveiling ceremony of 'March of Trinity' aka 'Trinity 2011'. Not wanting to be typecast in any way shape or form as a 'religious' artist, I have created a prodigious number of murals across Canada over the past 30 years in the secular realm. Here is a selected mural portfolio with The Urban Wall in Saskatoon to give you an idea. In case you were wondering, I remain to this day a successful kidney transplant thanks to the 'Gift of Life' from my loving brother Steven. He is doing well after 33 years too! One of my long-term goals is to be recognized as the World's Longest Surviving Kidney Transplant Recipient and at over 33 years I am definitely in the running. Just sayin'. HAPPY EARTH DAY to my fellow Earthlings!